Walt Scacchi (Ph.D. ’81), senior research scientist and research faculty at the Institute for Software Research and research director for the Center for Computer Games and Virtual Worlds, received the Bren School’s 2012 Distinguished Alumnus Award at the 42nd annual Lauds & Laurels ceremony, sponsored by the UCI Alumni Association. Dating back to his time as a graduate student, Scacchi has conducted nearly 40 years of research that has contributed significantly to the study of open source software development, large-scale software engineering, computer game culture and technology, and social analysis of software development projects. His work combines technical innovation with a keen understanding of the important role social factors play in the adoption of new technologies. 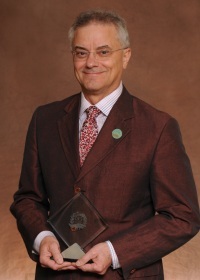 Scacchi’s research record includes more than 150 refereed publications (journal articles, conference proceedings papers and book chapters), and his projects have drawn $10 million in research funding over the last five years, with support from a wide range of corporate and government sponsors, including Intel Research Laboratories, the Northrop-Grumman Corporation and the National Science Foundation. Scacchi earned his undergraduate degrees in computer science and in mathematics from California State University, Fullerton before joining UCI’s graduate program in Information and Computer Science. He completed his Ph.D. in 1981 and accepted a faculty position at the University of Southern California. He spent 17 years at USC, the last 10 as a research professor in computer science and in the business school, before returning to UC Irvine in 1999.